Ziziphus jujuba (from Greek ζίζυφον, zízyphon), commonly called jujube (/ˈdʒuːdʒuːb/; sometimes jujuba), red date, Chinese date, is a species of Ziziphus in the buckthorn family (Rhamnaceae). It is a small deciduous tree or shrub reaching a height of 5–12 metres (16–39 ft), usually with thorny branches. The leaves are shiny-green, ovate-acute, 2–7 centimetres (0.79–2.76 in) long and 1–3 centimetres (0.39–1.18 in) wide, with three conspicuous veins at the base, and a finely toothed margin. The flowers are small, 5 mm (0.20 in) wide, with five inconspicuous yellowish-green petals. The fruit is an edible oval drupe 1.5–3 centimetres (0.59–1.18 in) deep; when immature it is smooth-green, with the consistency and taste of an apple, maturing brown to purplish-black, and eventually wrinkled, looking like a small date. There is a single hard kernel, similar to an olive pit, containing two seeds. This plant has been introduced in Madagascar and grows as an invasive species in the western part of the island. This plant is known as the "hinap" or "finab" in the eastern part of Bulgaria where it grows wild but is also a garden shrub, kept for its fruit. The fruit is picked in the autumn. The trees grow wild in the eastern Caribbean, and are reported to exist in Jamaica, The Bahamas, and Trinidad as well. In Antigua and Barbuda, the fruit is called "dumps" or "dums"; and in The Bahamas, "juju". It is also known as "pomme surette" on the French islands of the Caribbean. This fruit, more precisely known as "Indian jujube" elsewhere, is different from the "jujube" fruit that is cultivated in various parts of southern California. Altun Ha an ancient Mayan city in Belize, located in the Belize District about 50 kilometres (31 mi) north of Belize City and the surrounding woods also boasts some jujube tree and shrub varieties where it is referred to as plums for lack of a better word among locals. The species has a curious nomenclatural history, due to a combination of botanical naming regulations, and variations in spelling. It was first described scientifically by Carl Linnaeus as Rhamnus zizyphus, in Species Plantarum in 1753. Later, in 1768, Philip Miller concluded it was sufficiently distinct from Rhamnus to merit separation into a new genus, which he named Ziziphus jujube, using Linnaeus' species name for the genus but with a probably accidental single letter spelling difference, "i" for "y". For the species name, he used a different name, as tautonyms (repetition of exactly the same name in the genus and species) are not permitted in botanical naming. However, because of Miller's slightly different spelling, the combination the earlier species name (from Linnaeus) with the new genus, Ziziphus zizyphus, is not a tautonym, and was therefore permitted as a botanical name. This combination was made by Hermann Karsten in 1882. In 2006, a proposal was made to suppress the name Ziziphus zizyphus in favor of Ziziphus jujuba, and this proposal was accepted in 2011. Ziziphus jujuba is thus the correct scientific name for this species. In Arabic-speaking regions the jujube and alternatively the species Z. lotus are closely related to the lote-trees (sing. "sidrah", pl. "sidr") which are mentioned in the Quran, while in Palestine it is rather the species Z. spina-christi that is called sidr. Varieties of jujube include Li, Lang, Sherwood, Silverhill, So, Shui Men and GA 866. Jujube was domesticated in south Asia by 9000 BC. Over 400 cultivars have been selected. The tree tolerates a wide range of temperatures and rainfall, though it requires hot summers and sufficient water for acceptable fruiting. Unlike most of the other species in the genus, it tolerates fairly cold winters, surviving temperatures down to about −15 °C (5 °F). This enables the jujube to grow in mountain or desert habitats, provided there is access to underground water throughout the summer. The jujube, Z. jujuba grows in cooler regions of Asia. Five or more other species of Ziziphus are widely distributed in milder climates to hot deserts of Asia and Africa. In Madagascar, jujube trees grow extensively in the western half of the island, from the north all the way to the south. It is widely eaten by free-ranging zebus, and its seeds grow easily in zebu feces. It is an invasive species there, threatening mostly protected areas. On his visit to Medina, the 19th-century English explorer, Sir Richard Burton, observed that the local variety of jujube fruit was widely eaten. He describes its taste as "like a bad plum, an unrepentant cherry and an insipid apple." He gives the local names for three varieties as "Hindi (Indian), Baladi (native), Tamri (date-like)." In Palestine a hundred years ago, a close variety was common in the Jordan valley and around Jerusalem. The bedouin valued the fruit, calling it nabk. It could be dried and kept for winter or made into a paste which was used as bread. In Persian cuisine, the dried drupes are known as annab, while in neighboring Azerbaijan, it is commonly eaten as a snack, and is known as innab. Confusion in the common name apparently is widespread. The innab is Z. jujuba: the local name ber is not used for innab. Rather, ber is used for three other cultivated or wild species, e.g., Z. spina-christi, Z. mauritiana, and Z. nummularia in Pakistan and parts of India and is eaten both fresh and dried. The Arabic name sidr is used for Ziziphus species other than Z. jujuba. Traditionally in India, the fruit is dried in the sun and the hard nuts are removed. Then, it is pounded with tamarind, red chillies, salt, and jaggery. In some parts of the Indian state of Tamil Nadu, fresh whole ripe fruit is crushed with the above ingredients and dried under the sun to make cakes called ilanthai vadai or regi vadiyalu (Telugu). It is also commonly consumed as a snack. The commercial jujube candy popular in movie theaters originally contained jujube juice but now uses other flavorings. The fruit and its seeds are used in Chinese and Korean traditional medicine, where they are believed to alleviate stress, and traditionally for anti-fungal, anti-bacterial, anti-ulcer, anti-inflammatory purposes and sedation, antispastic, antifertility/contraception, hypotensive and antinephritic, cardiotonic, antioxidant, immunostimulant, and wound healing properties. It is among the fruits used in Kampo. 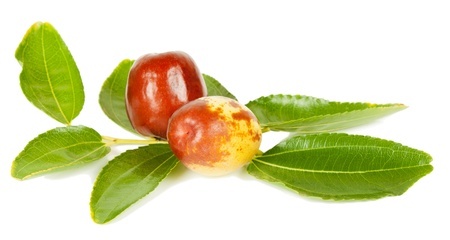 Ziziphin, a compound in the leaves of the jujube, suppresses the ability to perceive sweet taste. Witch's brooms, prevalent in China and Korea, is the main disease affecting jujubes, though plantings in North America currently are not affected by any pests or diseases. In Europe, the last several years have seen some 80%–90% of the jujube crop eaten by insect larvae (see picture), including those of the false codling moth, Thaumatotibia (Cryptophlebia) leucotreta.